Why is positioning my newborn so important? The American Academy of Pediatrics recommends placing your child on his or her back to sleep. This is a very important way to prevent Sudden Infant Death Syndrome. When infants are born they have very moldable heads to fit through the birth canal. They also have weak neck muscles that control their head motions because they have not yet had practice with gravity. This combination makes it difficult for most babies to reposition their head when lying down. In order to ensure your child’s head shape develops symmetrically, it is important that pressure from the support surface (bed, stroller, car seat, swing, bouncy seat) is not always in the same spot. If a baby lies only in one preferred position he or she can develop a flat spot there. When the child is awake, parents can change a baby’s position by alternately placing the baby on his tummy, on his right side and then on the left side. You can also change the direction your baby’s head faces in the crib – one day at the head of the bed, one day at the foot of the bed. Babies learn very early to look towards the door, because they know their caregiver will come from that direction. As an infant gets a little more head control, supported sitting can also be added. There is an FDA-approved knit beanie on the market that helps prevent and treat Flat Head Syndrome. It is called a “Tortle” and it is a simple repositioning aid that is recommended for all newborns. 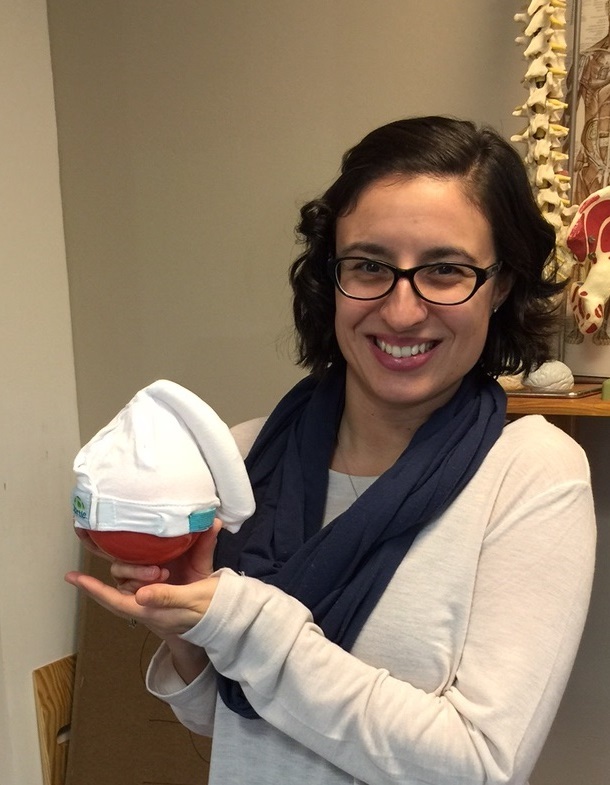 Mora Pluchino, DPT and clinical coordinator of the pediatrics program is pictured above showing a Tortle with its characteristic side element. If you think your baby may have this problem, talk to your child’s pediatrician about your concerns. It might also be helpful to have an evaluation with a Physical Therapist to review and practice positioning your baby.